Want Surf More Quick and safe? Of Course! 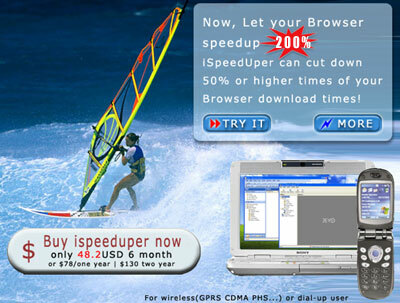 Just Use Surf Speeduper 200% it can cut down 50% or more Browse times!!! Surf Speeduper 200% is the wireless* user's First-rank choice! MEDA Picture Finder - Powerful Picture Finder, Image Finder, Pic Finder for you, Download pictures from web site automatically. MyOneLink - An integration of unified messaging, broadcasting message, and office/home motion detection applications. PICgrabber - The software that finds millions of free movies and free pictures for you, a picture grabber tool. Picdownloader - The easiest, fastest and most creative way to download pictures from internet automatically. SurfOffline - Fast and convenient offline browser with easy navigation and simple interfac! Visual Web Task - A powerful web crawler, Visual Web Task is advanced web crawler that parses HTML tags and extracts data and files. Speed Master - Optimize your internet connection speed. SpeedUpMyPC - The best speed up computer software ! Keeping your system running in top shape!